Here's why highway departments across the nation count on the Cutler single machine asphalt recycling system. More pavement maintenance per budgeted dollar: A U.S. Department of Transportation study has shown that single pass asphalt recycling provides 35% more pavement repair for every maintenance dollar spent. Pavement performance: The performance of a hot in-place recycled pavement is the approximate equivalent to conventionally constructed pavement in terms of cracking, rutting, raveling, stripping and skid resistance, according to a National Cooperative Highway research study. The resulting surface has a service life of at least 7 to 12 years, and is among the smoothest overall finishes in the industry. Preserves roadway geometry: By minimizing the amount of new overlay required to rehabilitate the pavement surface, the Cutler single pass system preserves the integrity of overpass clearances, guardrails and shoulders. Less inconvenience, improved safety: Because the Cutler single machine recycling system simultaneously recycles and resurfaces the roadway, traffic delays are minimized and motorists are spared the risk of driving on uneven, oily surfaces and the danger of flying rocks and construction materials. Transportable technology: The Cutler Repaver is readily transportable to any job site. Cities also count on all the benefits of single machine asphalt recycling. Notice how this south Florida city saved money and resources by using hot-in-place recycling in its community. Because of the durability of hot-in-place recycling, annual pavement life cycle costs decrease year after year. 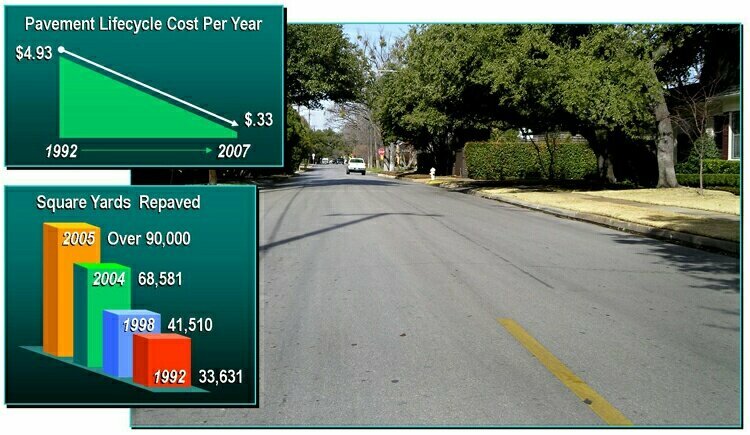 That performance is why this Texas city has steadily increased its use of repaving. (Pictured here: Golf Drive, University Park, Texas, Summer 2007, after 15 years of service). Focus on Texas.